This week Johann Wilhelm Boberg is shouting out, I am presuming that it means someone is looking for him and I am hoping we can connect. Crazy how they come to me, it seems like it’s just his time. 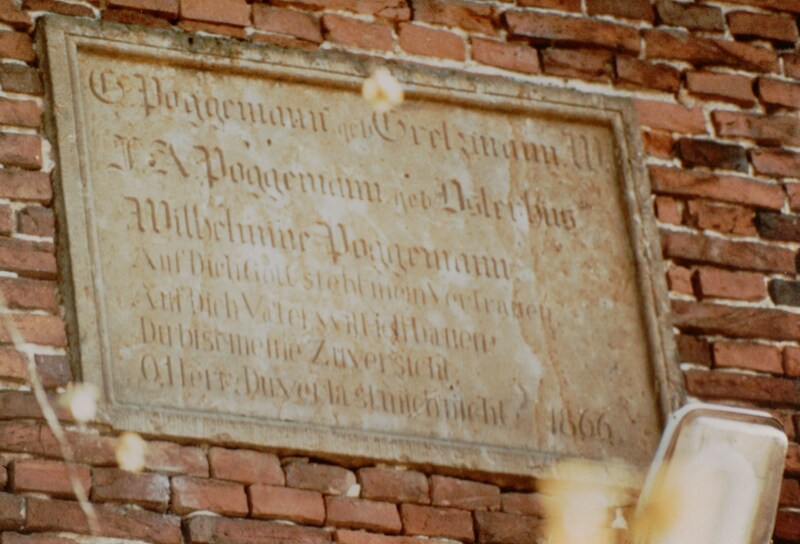 Okay, Johann Wilhelm Boberg was born on the 26th day of April 1816 in Ohrbeck, Lower Saxony to Johann Heinrich Kuhlmeyer and Margarita Elizabeth Boberg. 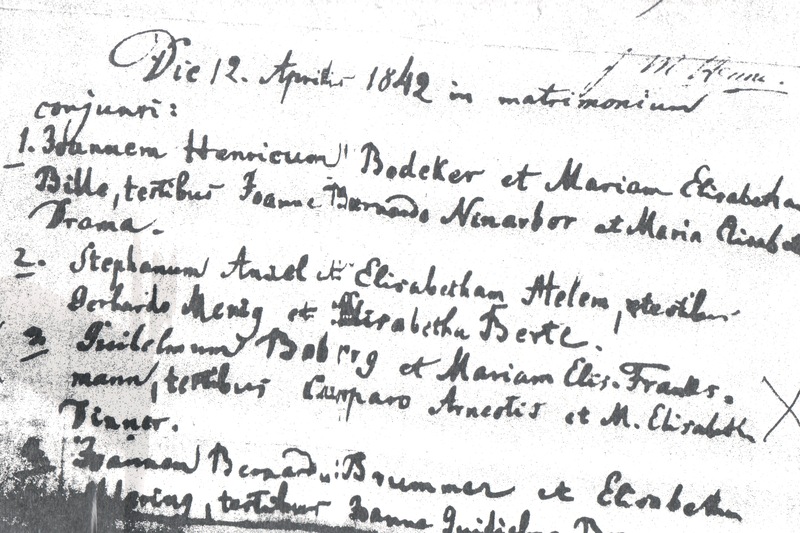 Yes, they were married, that date was 20th October 1805 in Osnabrück, Hanover. Johann Heinrich married an only daughter. To inherit the farm he had to take his wifes maiden name since she was the oldest daughter and her parents had no sons. Funny thing, Margarita’s father had to do the same thing to inherit the farm. Below you can see the photos’ I was given by my mother-in-law, Phyllis Miller. Hof Boberg, X mark’s where the farm is. 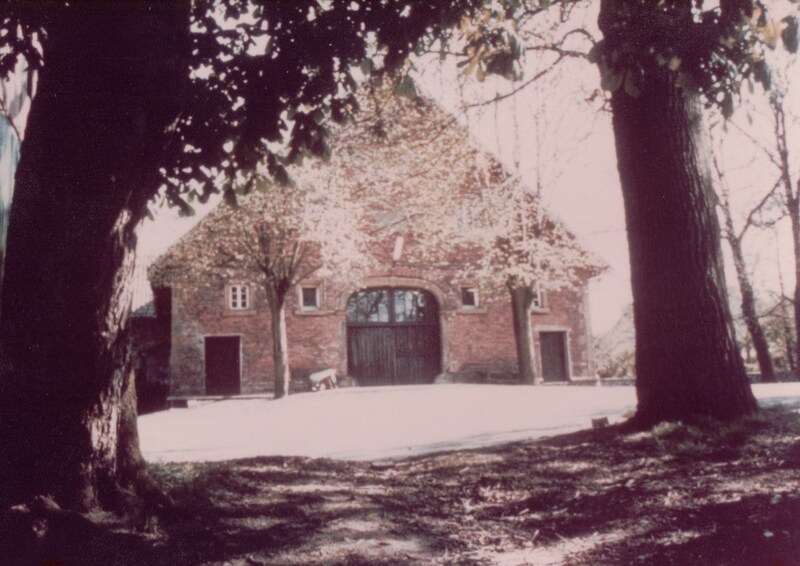 This was taken by Axel Flake taken in May 1982. Legend has it that William immigrated with his future wife and her brother coming into the port of New Orleans on a clipper ship. They made their way up the Mississippi River and then the Ohio River to settle in Cincinnati, Ohio. This was the largest group of German population in the United States at the time. William and C. Maria Elizabeth were married on the 12 of April 1842 in the Holy Trinity Catholic Church in Cincinnati, Hamilton, Ohio. This is a copy of the actual page in the Catholic Church record. The Boberg’s first child Maria Engel was born in Cincinnati on 23 May 1843. The family moved across the river to Covington, Kentucky before Anna Maria was born in 1845. Theodore in 1849 and Josephine in 1850 completed the family. William was a farmer in Covington having a dairy farm just south of Covington. 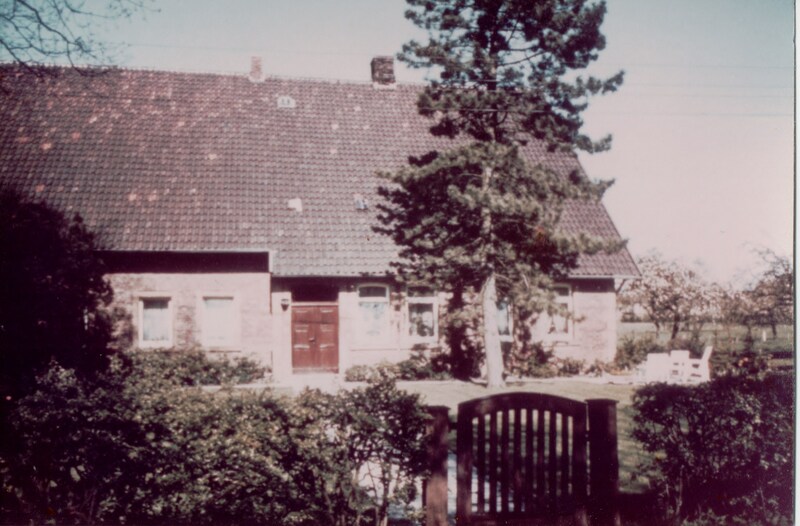 In 1860 the family is still listed as living in Covington, Johan’s brother, Johann Heinrich, is now living with them, he is 19 and a tailor. The American Civil War begins in 1861, and about this time Johan Wilhelm disappears, it is understood he was working for the Railroad at the time and was in New Orleans on business. He never returns home. Legend tells us that he was conscripted in the Confederate Army. I have checked and not found any mention of his name in either Army’s records. Marion Stone (my husband’s grandmother) in her records gave the date of 27 January 1864 New Orleans, Louisiana as his death. I’ve not been able to find anything to prove this at the time of this writing. His wife, Elizabeth, is buying and selling land in Covington, which at that time she would have had to have him declared dead but again, nothing has arisen yet. 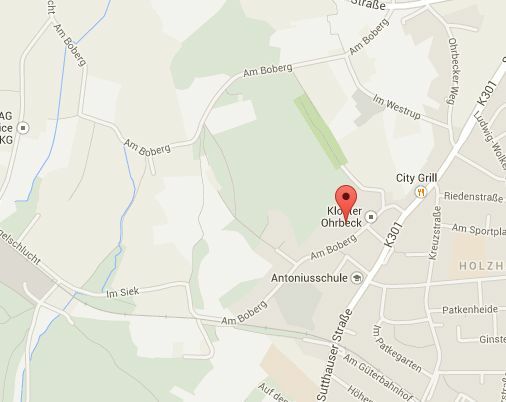 Today’s Google map of the Ohrbeck area, note that Am Boberg is still on the map. Can’t wait to visit someday. Now Apparently through time, one of the son in laws didn’t want to change his surname. This is what is on the house/barn. This entry was posted in Blog and tagged Am Boberg, Catharine Maria Elizabeth Franxmann, Civil War 1864 Conscriptions, Covington, early Cincinnati German, Germany, Hof Boberg, Holy Trinity Catholic Church Cincinnati, johann, Johann Wilhelm Boberg, Kentucky, Lower Saxony, Margarita Elizabeth Boberg, New Orleans Passengers, Ohrbeck. Bookmark the permalink. My name is Lucas Schilling and I am currently holding copies of the Boberg farm as I am researching some family genealogy. Would be great to reach out and make a connection. Lucas Schilling, please email me at elusiveancestor@gmail.com. I’d love to reach out also. So sorry, not sure which email you will get either this one or my main email geneacathy@gmail.com. I’d love to connect with you.